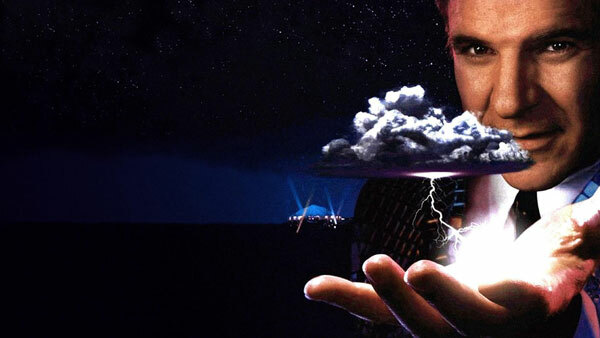 Stream Watch: The magical place where random movies are discovered and revisited. Today’s pick: Leap of Faith, a 1992 drama starring Steve Martin, Debra Winger and Liam Neeson. Martin plays Jonas Nightengale, a flimflam salesman, as the Amazing Randi would say, who tours the country with his traveling show of religious miracles. Things take a dramatic turn, however, when his bus breaks down in a small, rural Texas town (even 20 years ago this cliche was old) and the kindly townsfolk move him in unexpected ways. I have a bit of fuzzy history with Leap of Faith. The VHS used to collect dust at the local video store that I frequented as a kid. It always seemed like some kind of boring adult drama that was to be skipped and never thought of again. Then years later, I caught parts of it on HBO, the real channel. The movie was a lot funnier and more entertaining than I had imagined. So it was a pleasant surprise…and a nice thing to have on in the background while I did my homework. A few years after that, I found the original theatrical one sheet for Leap of Faith at a poster sale hosted by the Oriental Theater in Milwaukee. The price was 25 cents. That’s right. A whole quarter. Needless to say, I bought it. 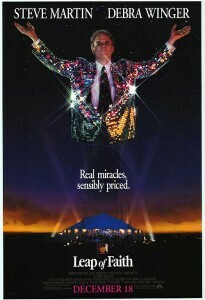 I mean, who wouldn’t want a large poster of Steve Martin wearing a glittery jacket hanging up in their room? I would be the envy of college freshman everywhere. Now we arrive back to the present. Leap of Faith has risen again, thanks to Max Go. And it holds up really well. Finally having been able to watch the entire movie, I stand by what I thought before. It works: it’s entertaining, fast-paced, well-acted and has a surprising amount of depth. The kind of flimflammers that skeptic James Randi has spent his career debunking are scary people. Just take a look at the famous case of televangelist Peter Popoff. Randi exposed him as a manipulative con artist, the very antithesis of what he appeared to be (Popoff briefly resurfaced many years later, still at it). The miracle of Leap of Faith is that Martin, with the help of a clever script by Janus Cercone (whose only other major credit is sadly the Matt LeBlanc/Chimp buddy pic Ed), manages to turn the Nightengale character from a Popoff clone into a real person. He’s at a crossroads: continue the scam or live honestly. He can’t do both.